Your roof protects your home from the elements. Pretty basic stuff, right? Less obvious are the parts that go into the whole roof system. Maybe you’ve never heard of roofing underlayment. It’s doing a lot of work for you every day. Roofing underlayment is a water-resistant or waterproof barrier material that is installed directly onto your roof deck. It is applied under all other roofing materials as an added layer of protection from severe weather. Asphalt-saturated felt was the go-to roofing underlayment until about 15 years ago. That’s when synthetic products started gaining in popularity. Commonly referred to as “felt paper” or “tar paper,” common roofing felt is made of varying blends of cellulose (natural plant fibers), polyester, bitumen or asphalt. Basemat – the flexible base layer – is saturated with asphalt for water resistance. Felt paper is applied across the entire roof deck. Depending on local weather, waterproof underlayment may be recommended. Synthetic underlayment (technically non-bitumen synthetic underlayment) is the preferred underlayment of most roofing professionals today. Synthetic underlayment basemat is saturated in asphalt. The addition of fiberglass gives synthetic products superior tear resistance and stability. High-quality synthetic underlayment like CertainTeed’s DiamondDeck™ has the added benefit of scrim reinforcement for added slip resistance, even when wet. Synthetic underlayment is designed for application across the entire roof deck. It is sometimes used with waterproof products. Rubberized asphalt is more expensive than other types pf roofing underlayment. Why? It contains higher percentages of asphalt and rubber polymers, making it waterproof. Rubberized asphalt roofing underlayment often has a sticky back with a protective membrane that is removed prior to installation. This special backing creates the waterproof seal between the underlayment and a clean roof deck. In severe winter regions, waterproof roofing underlayment at the eaves of a roof is helpful. The underlayment protects the edge of the roof deck from water damage. Rubberized asphalt roofing underlayment should be added at valleys and around roof protrusions. These spots often get leaky first. Why do you need roofing underlayment? Roofing underlayment provides your roof with an extra layer of protection that shingles alone can’t match. Your shingles serve their own purpose: they’re the first line of defense. Shingles reflect the sun’s rays, withstand wind and block precipitation. But shingles overlap and aren’t sealed at all corners. They can be lifted by strong winds. 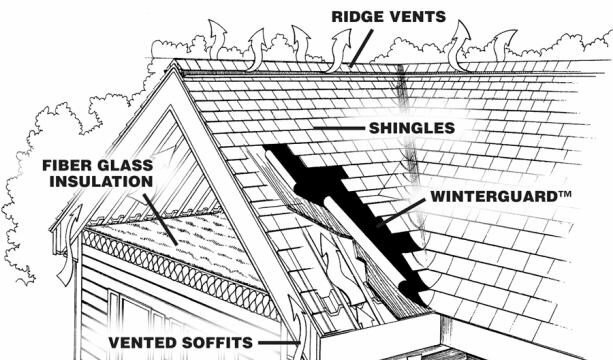 This makes shingles vulnerable to tear-off or infiltration by wind-driven rain. Shingles can become brittle from ag. The heat of an unventilated attic can cook your shingles, too. Water-resistant underlayment is enough for the surfaces of most roofs. It provides the protection that your roof needs during and after installation. Even without the added protection of shingles, a superior product can withstand some seriously extreme weather. 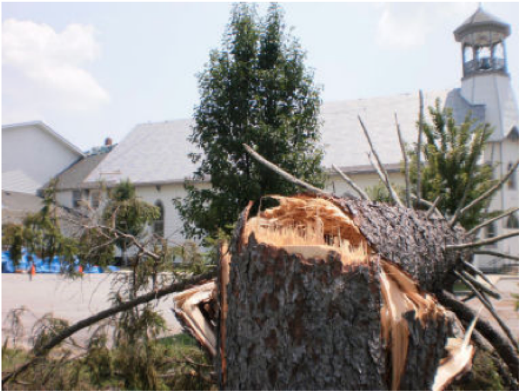 The image below shows the wind damage caused by an extreme weather event in Hollywood, Maryland on July 19, 2011. The 20-inch diameter pine tree in this photo was snapped in half by winds reported to be in excess of 80 miles per hour. In the background, you can see a church undergoing a roof replacement. CertainTeed’s DiamondDeck™ water-resistant underlayment was the only roofing material on this roof when the storm hit. This photograph of the church roof (below) was taken the same day as the one above. It shows that DiamondDeck™ alone protected this roof during an unexpected extreme weather event. These photographs show that no parts of the underlayment were torn or lifted. There were no leaks. That’s strong underlayment! There are regions where only waterproof roofing underlayment should be used. Waterproof underlayment is recommended for roofs in regions prone to high winds or ice damning. Are you using roofing underlayment? What kind? Your roofing warranty may be contingent on the answer. Check your roof’s warranty coverage – it may also define how (staples or wind strips) and where (eaves, low-slope roofs) the underlayment is to be installed. A new roof is a significant investment for most homeowners. Don’t overlook your roofing warranty details. Contact Long Roofing at (800) 417-5664. Visit us online to get a price, schedule a free, in-home consultation or find answers to any home roofing questions. Ask us about our industry-leading 50-year roofing warranty!